Things have not been going well for BlackBerry for a very long time now, but in recent weeks the future has started to look particularly grim for the smartphone maker. And thanks to the company's most recent regulatory filing, filed Oct. 1, we have glaring evidence BlackBerry is in trouble on a worldwide scale. In the filing, the company formerly known as RIM estimates that BlackBerry unit sales direct to customers (this doesn't include handsets shipped to carriers) were approximately 5.9 million - a far cry from the iPhone 5S and iPhone 5C's record setting 9 million sales in just three days. Adding the ailing dinosaur joke to injury, of the 5.9 million phones sold last quarter, 4.2 million ran the old BlackBerry 7 operating system. It's really no surprise as BlackBerry is still sitting on a huge cache of Z10 running the BlackBerry 10 operating system. Piling on the pain, BlackBerry is faltering not just in North America but in regions where it once flourished. "The intense competition impacting the company's financial and operational results that previously affected demand in the United States market is now being experienced globally, including in international markets where the company has historically experienced rapid growth," BlackBerry wrote in the filing. The company blames the emerging market of lower end Android-based devices pushing BB7 devices out of the limelight. Meanwhile its higher-end devices fail to deliver the same variety of apps as on iOS and Android - which are ironically still missing the long delayed BBM app. BlackBerry's one saving grace, its global messaging service, also took a hit, decreasing the revenue the service pulls in by $269 million (about £182m/AU$315m) to $724 million (about £446m/AU$771m). 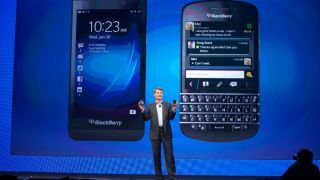 The only beacon of hope on Blackberry's horizon is a tentative deal to sell itself to the Toronto-based Fairfax Financial Holdings. But like many things about BlackBerry, this announcement came last week with a depressing caveat that it would also layoff 4,500 employees, or about 40% of its workforce. BlackBerry declined comment on our report. Online drug market Silk Road is having a bad time too.